Dr. David Fields is proud to offer the residents of Smyrna, Vinings, and the surrounding communities in Atlanta, GA the ability to bring their best smile forward with innovative prepless veneers treatments. Prepless veneer treatments by Dr. Fields are available at Smile Envy Dental Group in Atlanta, GA.
A veneer is a thin porcelain or ceramic shell that is used to cover a defect on one or more teeth. Prepless veneers are extremely versatile and can be used to meet many patient goals. When placed over natural teeth, prepless veneers cover any defect that is caused by discoloration and broken teeth, giving patients a beautiful smile for many years. How Does Prepless Veneers Differ From Porcelain Veneers? For porcelain veneers, a layer of enamel is sanded off your teeth, so the veneers sit evenly when compared to your gums. Prepless veneers are thinner than porcelain veneers and, therefore, do not require the layer of enamel to be removed. This keeps your teeth naturally intact and safe under the prepless veneers. In the event you want prepless veneers removed, you can easily do so without worry of lost enamel to your teeth. Are Prepless Veneers Right For Me? If you desire a beautiful, bright and even smile without removing enamel from your teeth, prepless veneers may be right for you. To discover how prepless veneers can change your smile, contact a friendly member of the Smile Envy Dental Group today and schedule a consultation with Dr. David Fields. During your consultation with Dr. Fields, you will discuss your goals, including why you are considering prepless veneers. Dr. Fields will examine your mouth and may take x-rays and measurements. Once it is determined that prepless veneers are the right fit for you, we will schedule your treatment date. During the treatment appointment, your teeth will be cleaned thoroughly. 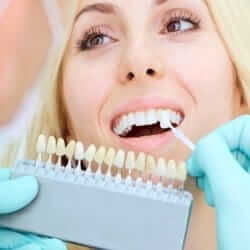 The prepless veneers will be placed over your natural teeth. Dr. Fields and his team will use a special light to ensure the veneers are properly bonded to your teeth. Once complete, you will immediately see the results and smile with satisfaction. How Much Do Prepless Veneers Cost? As with most cosmetic dentistry, the cost of treatment varies from patient to patient depending on individual needs and depth of treatment. Prepless veneers may be covered by your dental insurance plan. A knowledgeable member of our staff can help you determine what your total costs will be. Smile Envy Dental Group offers a variety of convenient payment options, including CareCredit®, a friendly financing option to fit your budget. Dr. David Fields can help patients determine if prepless veneers or any other cosmetic dentistry treatment is a viable treatment option. Contact us at Smile Envy Dental Group today to schedule a personal consultation with Dr. Fields.